The local real estate market has experienced a surge in prices in the last few years. Latest data from property analyst Colliers International Philippines pegged the capital value of luxury residential units in Makati at a maximum of Php301,000 per square meter for the second quarter of 2018. That’s a 125-percent increase from the maximum value recorded by end-2010. As well, maximum rental rates of premium Makati office spaces grew by about 93 percent from 2010 to 2018, with rates reaching as high as Php1,700 per square meter per month in the second quarter of 2018. After years of rising property prices and sustained construction boom, what are the remaining opportunities in the Philippine property market? Is there still room for further growth in both prices and supply? How can foreign investors take part in the opportunities offered by the country’s real estate boom? To address these important and timely questions, the Italian Chamber of Commerce in the Philippines (ICCPI) will hold its second Real Estate and Investment Conference on September 25. The conference is a one-day event that will tackle several topics pertaining to the country’s real estate industry and trends in property investment. 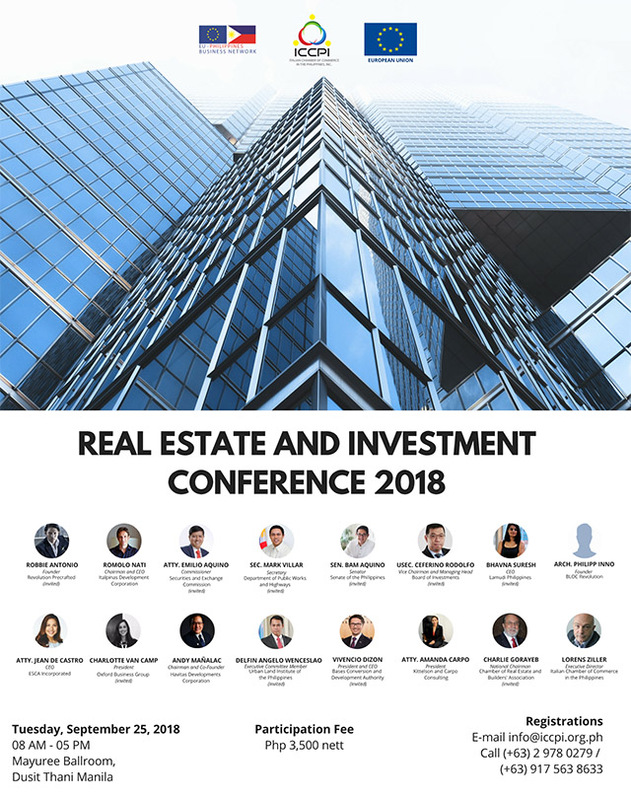 “This year’s conference is divided into three different sessions which encompasses topics on the status of the Philippine real estate industry, opportunities and risks in investing in the real estate industry of the Philippines, the complex issue of foreign ownership in Philippine Real Estate, and the future and innovations in the industry,” wrote the ICCPI in the press release. Officials from various government agencies will speak about the growth of the country’s real estate sector and how property investments play a part in this growth. Among those confirmed to speak in the event are Governor Lucita Reyes of the Board of Investments (BOI) and Business Development Officer Joan Grace Ortilla from the Bases Conversion and Development Authority (BCDA). Representatives from the Department of Public Works and Highways, Securities and Exchange Commission, and Urban Land Institute of the Philippines have also been invited to share their insights. Executives and experts from the private sector will also talk about current and future trends in property investing. These include Romolo Nati, chairman and CEO of listed real estate firm Italpinas Development Corp.; Amanda Carpo, president of local consultancy Kittelson and Carpo Consulting; and Philipp Inno, architect and founder of BLOC. Interested participants can register online by clicking here. For more information, visit ICCPI’s website by clicking here.